Taut. 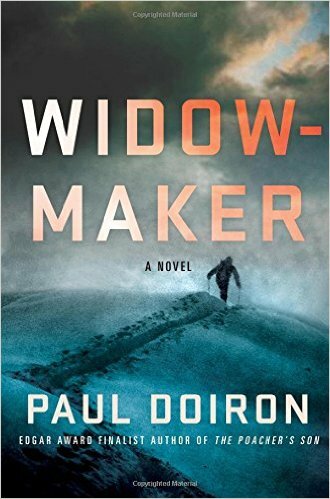 I found that the seventh novel by Paul Doirion to feature Maine warden Mike Bowditch titled, Widowmaker, was paced a bit slower than the previous books. That rhythm was fine with me. Mike is drawn into searching for a missing person for personal reasons that involve unresolved issues from his past. The past is never too far removed from his thoughts in the present. The Maine woods carry a lot of secrets, and Mike remains emotionally taut throughout this novel dealing with one thing after another. He and Stacey are also under stress and tension in their relationship. His job, as always, brings challenges. Fans of crime fiction are those most likely to enjoy this novel. Rating: Four-star (I like it) Click here to purchase Widowmaker from amazon.com. Possibilities. 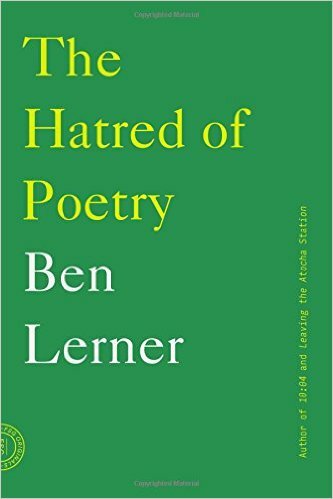 Two things delighted me about Ben Lerner’s book titled, The Hatred of Poetry. First, reading this essay-length book doesn’t take very long. Second, a defense of poetry through the path of hatred was great fun to read. The whole idea that poetry and the hatred of poetry being inextricable was great. Our language always falls short of expressing what we feel, and every poem, no matter how ambitious and great in exploring the possibilities, misses the mark. Thus stirred by Lerner’s finely written prose about poetry, I completed his book with a smile, and went to a bookshelf to read a poem. I encourage you to do the same. Rating: Four-star (I like it) Click here to purchase The Hatred of Poetry from amazon.com. Characters. 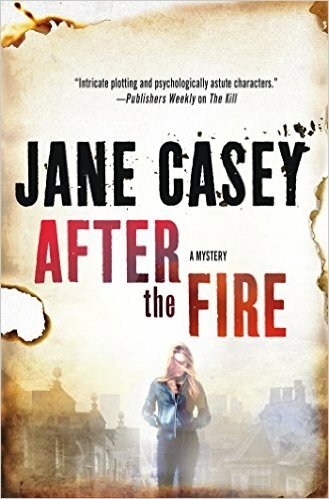 Jane Casey’s sixth novel to feature London police detective Maeve Kerrigan is titled, After the Fire. Three people are killed in a fire at the Maudling Estate housing project, one of whom was a wealthy politician who seemed to be distinctly out of place in this setting. 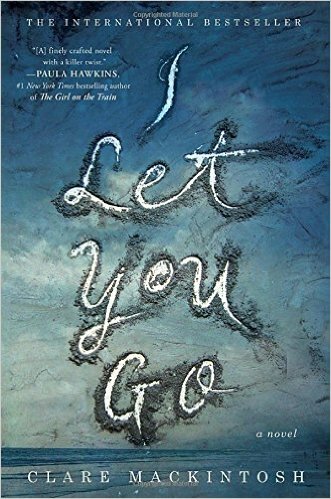 Maeve and her boss, Josh Derwent, go at each other with fervor in this installment, and both are developed with more depth and complexity than in the earlier novels. Josh’s boss, Una Burt, has his number, and that adds to the plot in interesting ways. While the mystery is well done, I find it is the characters that I enjoy most in Casey’s novels. Readers who enjoy character-driven crime fiction are those most likely to enjoy this novel and this series. Rating: Four-star (I like it) Click here to purchase After the Fire from amazon.com. Guide. I think Dave Barry had a lot of fun writing his latest book titled, Best. State. Ever. 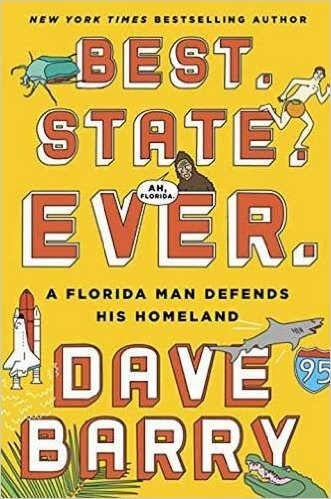 Fans of his humor are those readers most likely to love reading this book in which he takes us on a tour of some of Florida’s attractions and oddities. With him as our tour guide, the experiences are usually funny. Personally, I take his humor better in smaller doses. I found the wit wearing a bit thin for my taste after a chapter or two. I still laughed. Rating: Three-star (It’s ok) Click here to purchase Best. State. Ever. from amazon.com. Waves. 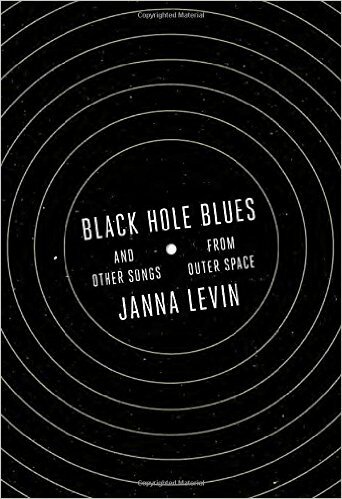 If, like me, your college physics course was the equivalent of “Physics for Poets,” you are likely to enjoy reading Janna Levin’s book about gravitational waves titled, Black Hole Blues and Other Songs from Outer Space. Using a light touch in presenting the science, Levin focuses on the people, the personalities, and their stories. The result is a readable and entertaining way of picking up something new about science while gaining resonance with scientists by Levin’s showing that their lives are as messy as our own. Rating: Four-star (I like it) Click here to purchase Black Hole Blues from amazon.com. Vengeance. 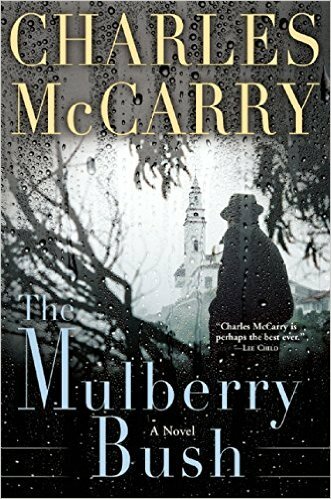 Readers who enjoy spy fiction are those most likely to appreciate Charles McCarry’s novel titled, The Mulberry Bush. McCarry frames the story from the viewpoint of a spy whose estranged father was a disgraced spy. The son embarks on a path of vengeance against those who destroyed his father’s career. All of the typical spy novel twists and turns add great pleasure to reading this novel. The multiple agendas of multiple characters may keep some readers on their toes. Rating: Four-star (I like it) Click here to purchase The Mulberry Bush from amazon.com. Aging. 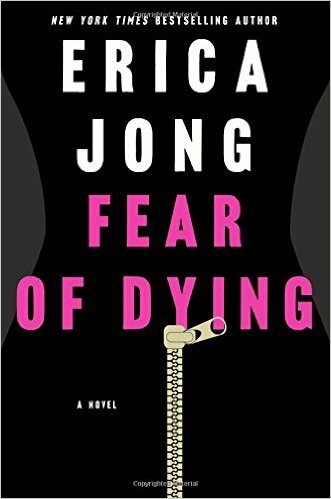 My recollection of laughing four decades ago while reading Erica Jong’s bestseller, Fear of Flying, led me to read her latest novel, Fear of Dying. Protagonist Vanessa Wonderman is struggling with a lot of aging issues now that she has arrived at age sixty. Her husband is older than she, and he has health problems. Her parents are struggling with old age, as is her poodle. All this could have made for either humor or insight. Instead, I was struck by the ways in which Vanessa chose to place her own needs at center stage. It all came across to me as meaningless, and neither funny nor wise. Rating: Two-star (I didn’t like it) Click here to purchase Fear of Dying from amazon.com. Abuse. The title of Chevy Stevens’ novel, Those Girls, refers to three sisters, Jess, Courtney and Dani Campbell. The taut emotional story begins on their ranch in Western Canada where they try to stay out of the way of their abusive father. After one bad fight, they run away together and find themselves in even greater jeopardy. 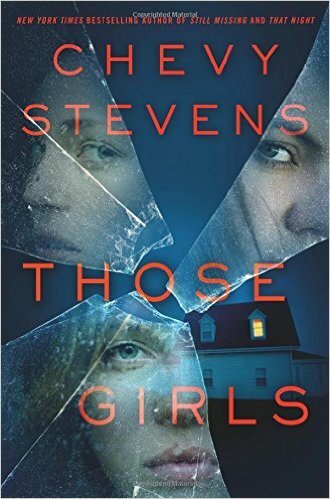 Stevens keeps the tension constant in this novel, and readers who enjoy thrillers are likely to be entertained by this one. Rating: Four-star (I like it) Click here to purchase Those Girls from amazon.com. Compromises. One of the milestones of adulthood involves the acceptance of compromises: the pragmatic reconciliation of ideals and reality. 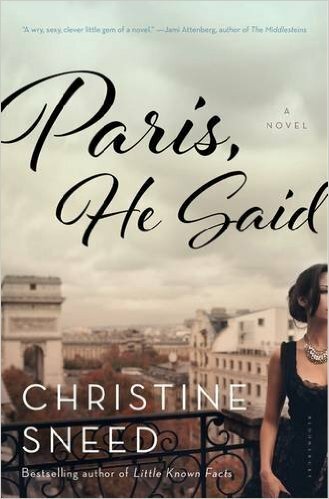 In her novel titled, Paris, He Said, Christine Sneed explores the things a young woman chooses to do for her art, and the ways in which a mentor can exploit a need while fulfilling desire. By alternating narrators, Sneed allows readers to understand different perspectives. Sneed’s prose will please many readers, and this novel might lead to interesting conversation among book group participants. Rating: Four-star (I like it) Click here to purchase Paris, He Said from amazon.com. Secrets. 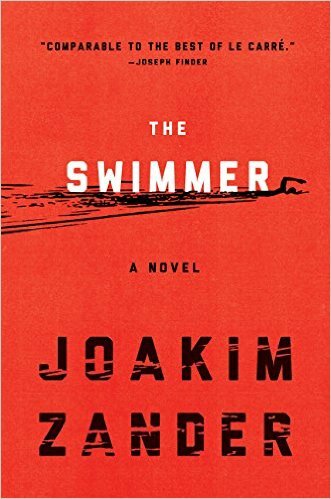 Joakim Zander’s ambitious debut novel titled, The Swimmer, lays out a whole series of plot lines and time lines that seem to be glimpses and unlikely to be connected. Before a reader knows what has happened, the threads begin to come together and by the end all the connections have been made, and those readers who buckled down for a turbulent ride were richly rewarded. Rating: Four-star (I like it) Click here to purchase The Swimmer from amazon.com. Watch. 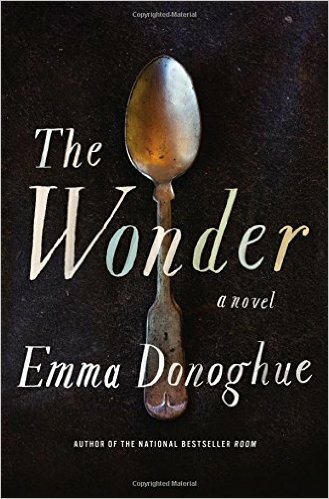 The latest novel by Emma Donoghue titled, The Wonder, is set in a small village in the middle of Ireland in 1859. The title refers to Anna, a young girl who claims to have not eaten in four months. A nurse trained by Florence Nightingale, Lib Wright, has been summoned to join another nurse in a round-the-clock monitoring of Anna to observe her with the intention to either affirm her claim or uncover how she is acquiring nourishment. Readers join this watch with Lib, and like observing a roadside accident, I found I could not look away. Anna’s health deteriorates as Lib watches, and Donoghue draws us gradually toward understanding of Anna and her fasting. Donoghue’s prose is finely written, and in this novel she tells a great story. I loved the novel from beginning to end. Rating: Five-star (I love it) Click here to purchase The Wonder from amazon.com. Unfinished. 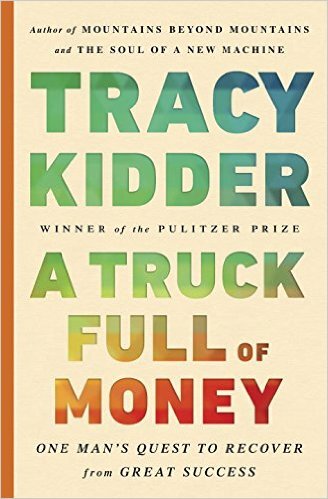 Tracy Kidder writes about the life of Paul English in his book titled, A Truck Full of Money: One Man’s Quest to Recover from Great Success. In many respects, this book describes volume one in the life of this interesting person. English was a co-founder of Kayak, and it was from the sale of that company that he obtained the money from the book’s title. To place that success in context, Kidder describes Paul’s early life, his struggle with the mood swings from his bipolar disorder, sometimes treated with medication, other times not. What flows from Paul’s mania can be great ideas that lead to new things, or a spiral of unfinished things that might have been. The quest involves a search for meaning and for how Paul can make a difference. Few writers are as skilled as Kidder at nonfiction narrative, and I have enjoyed every book of his that I’ve read. While I enjoyed this one, after I turned the last page, I reflected that the best parts of this unfinished life may be ahead. Read the book and see if you agree with me. Rating: Four-star (I like it) Click here to purchase A Truck Full of Money from amazon.com. Complexity. 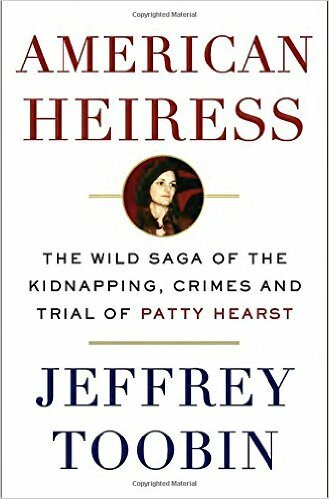 I fully expected to read a few pages of Jeffrey Toobin’s book titled, American Heiress: The Wild Saga of the Kidnapping, Crimes and Trial of Patty Hearst, and then set it aside. Instead, Toobin’s presentation of the complexity of this story grabbed me, and I stuck with him to the end. While I was somewhat aware of the events surrounding this story both at the time they took place and in the decades afterward, Toobin helped unravel multiple dimensions of the story as he laid out the kidnapping, the actions while Hearst was with the SLA, and her trial, punishment and pardon. Both readers and Toobin are still left with unanswered questions by the end alongside great satisfaction in exploring the old story in a fresh way. Rating: Four-star (I like it) Click here to purchase American Heiress from amazon.com. Connections. In the twelfth installment of the crime fiction series by Karin Fossum featuring Norwegian detective Konrad Sejer, the inspector remains in the background, providing not much more than the connective tissue that resolves the plot. 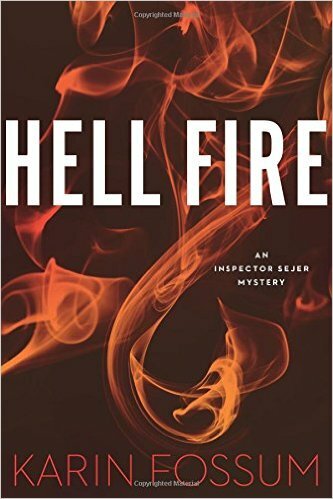 In Hell Fire, Fossum alternates the story of a single mother, Bonnie, and a young man, Eddie, forward and backward in time. Readers who enjoy the genre of dark Scandanavian crime fiction are those most likely to enjoy this novel and this series. Rating: Four-star (I like it) Click here to purchase Hell Fire from amazon.com. Compact. 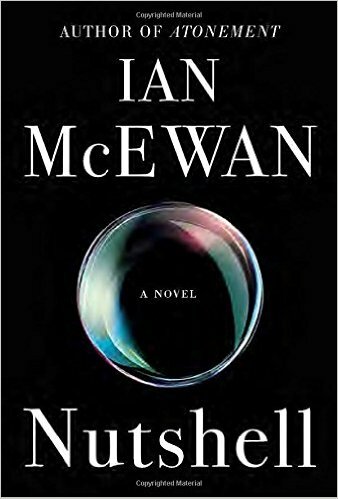 I love Ian McEwan’s novel titled, Nutshell, for many reasons. The originality and cleverness of using a fetus as narrator was brilliant. The notion that this fetus is full of insight and broad knowledge was a real kick, especially when it came to the commentary of the fetus about wine. McEwan’s prose, like the title, packs a wallop with great efficiency. He never uses two words when one will do. He never uses one word when five are necessary to deliver just the right impact. Some readers may see this as a modern take on Hamlet and enjoy McEwan’s approach even more from that perspective. Finally, first and last really, this is fine storytelling involving deceit and murder. Readers who love finely written literary fiction are those most like to enjoy this novel. Rating: Five-star (I love it) Click here to purchase Nutshell from amazon.com. Mortality. At a certain age, it is very appropriate to think often about death. 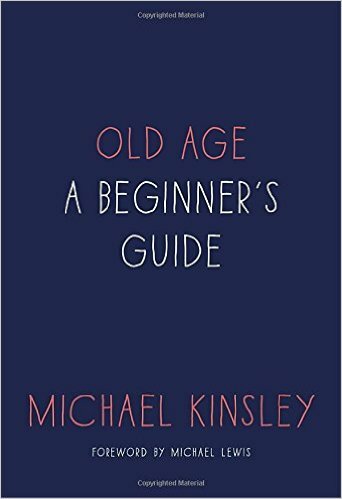 Michael Kinsley offers a short book about his own musings on the last stage in life in his book titled, Old Age: A Beginner’s Guide. Kinsley is a talented writer, and his prose in this book often weaves from humor to wisdom in the same sentence. He uses his personal experience with Parkinson’s disease to inform his thoughts on this subject, and that gives him a way to makes this book less antiseptic and more real. Readers of any age can enjoy fine prose and a lot of wisdom in this short book. Rating: Four-star (I like it) Click here to purchase Old Age from amazon.com. Chess. 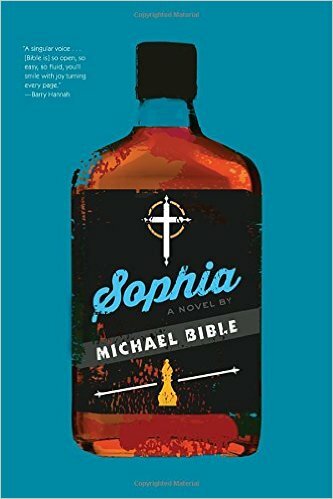 My guess is that few readers will be ambivalent about Michael Bible’s novel, Sophia. I found the prose strange, the characters unappealing and the plot not very interesting. Eli is a chess wiz, and he and the Reverend journey around the country as Eli wins tournaments and the Reverend keeps the winnings. While there is a struggle with spirituality that might be happening over the course of the novel, I found that I didn’t care. I laughed on occasion, but returned often to reflecting on what an odd novel this is. Some readers are likely to love its quirkiness. Read a sample to see if you might be one of those readers. Rating: Two-star (I didn’t like it) Click here to purchase Sophia from amazon.com. Control. 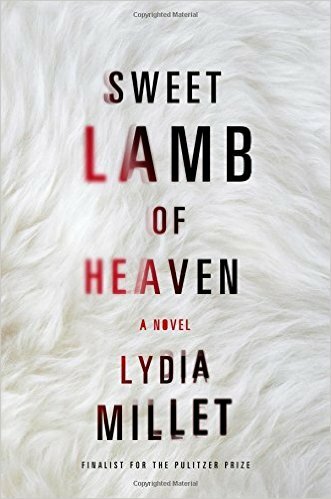 Readers who enjoy finely written psychological fiction with thrilling and complex plots are those most likely to appreciate everything that Lydia Millet achieves in her novel titled, Sweet Lamb of Heaven. Anna is both protagonist and narrator and Millet draws readers inside Anna’s mind to lead us on a thrilling journey of confusion, voices, hallucinations and control by others. Anna’s marriage is troubled, so she takes her six-year-old daughter, Lena, leaves husband, Ned, in Alaska, and heads to Maine. What Anna finds among residents at a Maine motel, and what Ned does provide much of the plot of the novel. Millet writes with great skill, and I enjoyed all the cleverness, confusion and creativity from the beginning to the end of this finely written novel. Rating: Four-star (I like it) Click here to purchase Sweet Lamb of Heaven from amazon.com. Poet. 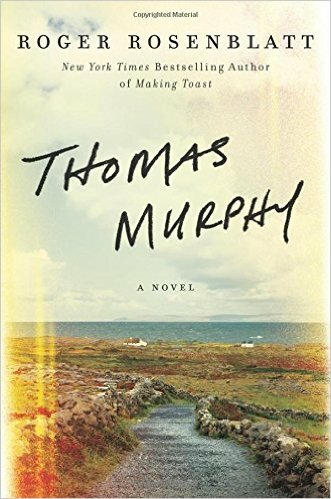 Take your aging mind and engage it with Roger Rosenblatt’s novel, Thomas Murphy, in which the irrepressible poet, Murph, wonders about his own aging mind, reflects on his life’s relationships, and charms every reader on every page. Once engaged, give yourself over to dreams, and beauty and laughter and all that remains possible for every day that we are alive. This novel is a song to life, sung by a great lover of life, an intelligent character created by a thoughtful writer. How much of the mind of either of them, or a reader, may be misfiring is another matter altogether. Leave that for another day. Rating: Four-star (I like it) Click here to purchase Thomas Murphy from amazon.com. Olympic. 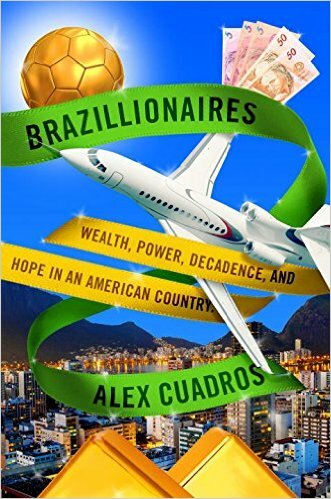 My 2016 Olympics pre-reading was Alex Cuadros’ finely written book titled, Brazillionaires: Wealth, Power, Decadence, and Hope in an American Country. The thrill of victory and the agony of defeat comes through loud and clear in this book, especially in relation to the rise and fall of Eike Batista. Any reader interested in Brazil will enjoy this finally written book. Rating: Four-star (I like it) Click here to purchase Brazillionaires from amazon.com. Connections. I recall that in Ann Patchett’s previous novels, she kept the plot focused on a short period of time. 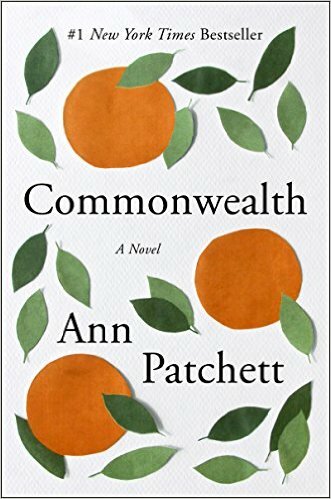 In her novel titled, Commonwealth, she spans fifty years with the exposition, and weaves in and out of the decades and the ten main characters in unpredictable ways. As fans have come to expect, Patchett’s descriptive prose is lyrical, and her character development is complete and insightful. I came to care deeply about this ensemble of characters, and the more I understood them, the more I enjoyed the novel. The connections of love and care provide direction for the novel and the unpredictable and fleeting paths of our lives are held in high regard. Losses are deeply held by some characters, and affect all. Mortality remains present and vivid. Patient readers who enjoy finely written literary fiction and who can tolerate non-linear exposition are those most likely to enjoy reading this novel. Rating: Five-star (I love it) Click here to purchase Commonwealth from amazon.com. Abuse. Clare Mackintosh grabbed me from page one of novel titled, I Let You Go. Five-year-old Jacob Jordon let go of his mother’s hand for just a second on a Bristol street in front of their home, and dies at the hand of a hit and run driver. The pace remains fast through the multiple narrators, as Mackintosh draws us into understanding of victims and the consequences of abuse. I was surprised by certain plot twists, and that added to my reading pleasure. Readers who enjoy psychological fiction are those most likely to enjoy reading this novel. Rating: Four-star (I like it) Click here to purchase I Let You Go from amazon.com. Uprooted. Novels can often hold up a mirror to our lives in ways that lead to delight or to depression. 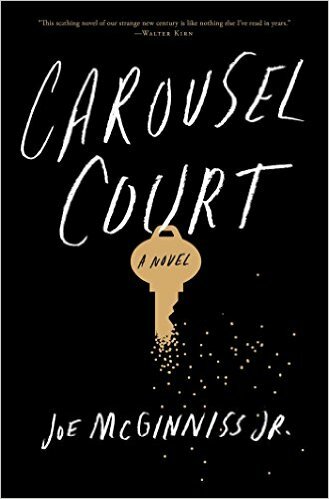 In his finely written novel titled, Carousel Court, Joe McGuiness, Jr. may lead readers in both directions. Phoebe and Nick Maguire move from Boston to California just as the financial crisis is about to descend on them and the rest of us. Their flip plan for a large California house flops. While many readers will find sadness and despair as they become uprooted in multiple ways, other readers will delight in the resilience that can be found by some of us when encountering setbacks. McGuiness makes us care about these characters, even though we may not like them or their behavior. We may encounter many novelists who choose the housing and financial crisis as a great canvas. McGuiness uses that backdrop very well in this novel, and readers who enjoy finely written literary fiction are those most likely to enjoy this book. Rating: Four-star (I like it) Click here to purchase Carousel Court from amazon.com. Presence. 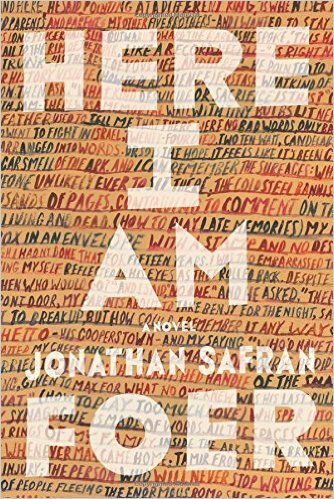 I spent many pleasant hours present with the writing of Jonathan Safran Foer is his latest novel, Here I Am. Over the course of almost six hundred pages, I laughed a lot, became annoyed regularly, and kept thinking about how much of life really does involve showing up and just being there. Along the way in this novel, we are bystanders as a marriage falls apart, precocious children come of age, older generations die, and (spoiler) a dog is finally put down. The separations are intense and the losses are deeply felt. On page 102, we learn about the title, a translation of the Hebrew word, hinemi, here I am, used in the biblical story of Abraham and the sacrifice of his son, Isaac, to mean wholly present. In the story, Abraham is present for God, and Abraham is present for Isaac. Protagonist Jacob is present throughout the novel, acclaiming that life is precious and he lives wholly present in the world, while often being clueless and inadequate. Jewish identity informs this novel and provides plot momentum involving a bar mitzvah and a threat to the survival of the State of Israel. Readers who enjoy the messiness of life, including virtual life that Foer also explores, and who delight in all the broken places that make up our reality, are those most likely to enjoy reading this novel. Rating: Four-star (I like it) Click here to purchase Here I Am from amazon.com. Outrage. 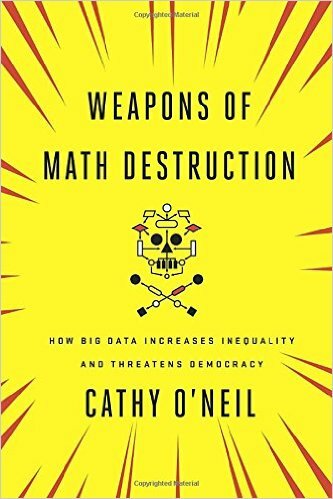 Readers interested in public policy, especially those who love quantitative analysis, are those most to enjoy reading Cathy O’Neil’s book titled, Weapons of Math Destruction: How Big Data Increases Inequality and Threatens Democracy. O’Neil presents many examples of ways in which algorithms are being used and often misused in many parts of society. Writing in a conversational style, she keeps her outrage at some practices on a steady simmer throughout the book. Her plea is that we need fairness and accountability in the application of mathematical models. She explores the use of models by schools, courts, credit providers, employers and others. If your mind is open to the possibility that aspects of “fact-based” analysis or the application of big data might be detrimental, be sure to read this book. Rating: Five-star (I love it) Click here to purchase Weapons of Math Destruction from amazon.com.